Home Archive by category "Fall"
The Girls Varsity Soccer match originally scheduled for Saturday, October 14th at Van Buren has been canceled due to a post-season conflict for Van Buren. We are currently updating the rosters and schedules for fall sports. New team photos will be added as soon as they are available. The boys soccer team will be playing Upper Sandusky Saturday night JV will be at 6:00 PM and Varsity will be after. 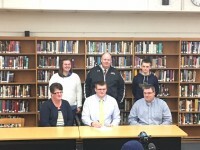 Senior Tyler Heintz (football) signs his National Letter of Intent to continue his educational and athletic career at Kent State University. The girls tennis match at Pleasant tonight (Monday, 9/26) has been postponed. The match will be made up on Tuesday, Oct. 4 at 4:30. Kenton High School boys soccer coach, Coach Jamie Bartlett, was named the division two boys soccer co coach of the year in the state of Ohio.